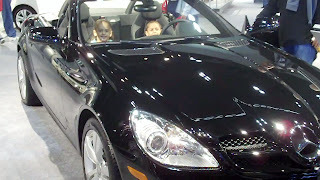 **Disclosure: The LA Auto Show invited us to preview the Auto Show at no charge for us. We had a great time and I am only sharing my opinion and experience there. Your opinion and experience may differ. Above the first one was the kids pick, mainly because it is a Transformer Off Road Vehicle. The bike is just so darn pretty I had to show it to you all, and the last one - the Mustang - WOW!!! Above the first picture my kids were absolutely convinced that that was indeed Bumble Bee! Now if you have seen any of the Fast and the Furious Movies you will love the second pic. I am a huge fan of those movies and was so excited at Scion's exhibit. They had six screens that played a video and at the end of the video, they screens would open up to reveal the new Scions - so cool! The last pic is of another dream car of mine....the Land Rover - and this one actually seats seven, loved it!! This past weekend was also the premier of the Kids Fun Zone at the LA Auto Show. The Kids Fun Zone is an all new weekend only event that features a variety of interactive activities including kids driving course, bubbles, bounce houses, games and so much more! One of the boys favorites parts of the zone was the XBOX exhibit where they had driving simulators set up to play the all new Forza Motorsport 3 video game. The game features over 400 cars - and let me tell you the features are amazing!! how come those neat concept cars never make it to market? The Mercedes is awesome but that Camaro makes me drool. Silly but I've always loved those cars since I had one back in the 90's. Not exactly something I can drive as a mom right now though lol. I'm wondering if they have a Kid Fun Zone at the Detroit show up here. If so I may just go this year. HaHa the Smart Car might be the wave of the future but It sure doesnt' look like it was designed by a smart person!! !